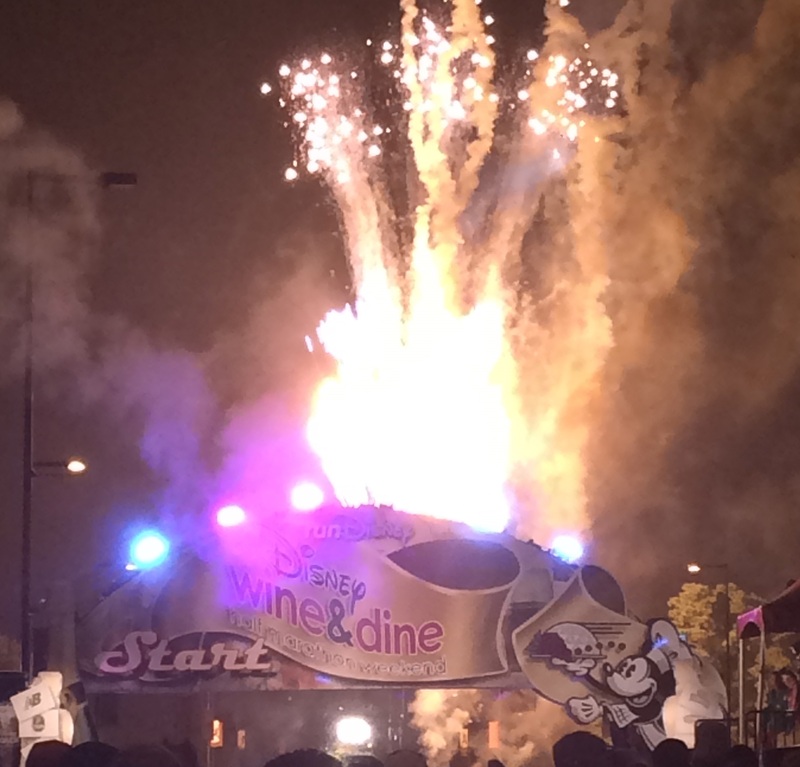 It is hard to believe that Disney’s Wine and Dine Half Marathon has come and gone. 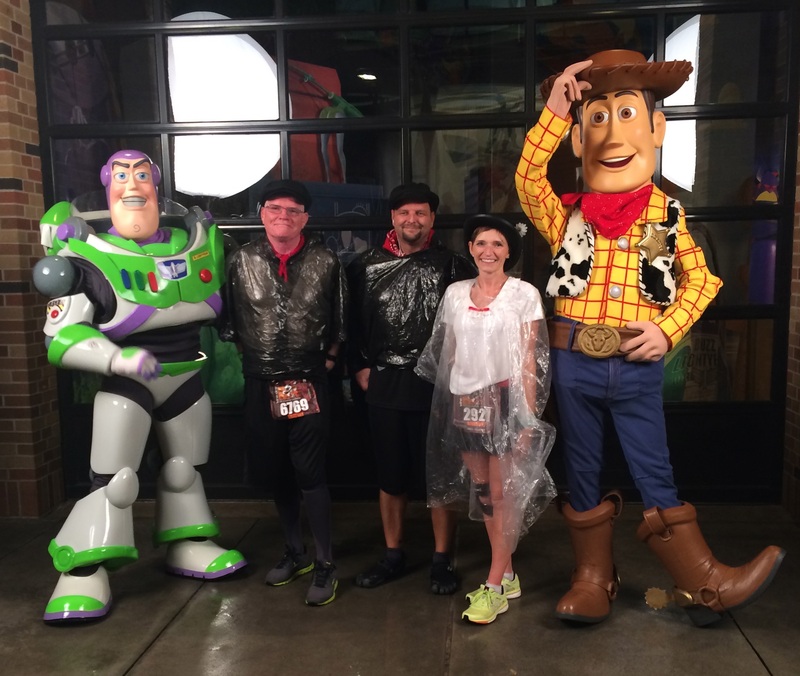 Despite the uncooperative weather, what has been dubbed “Disney’s Splash and Dash 2014” was truly an unforgettable experience. 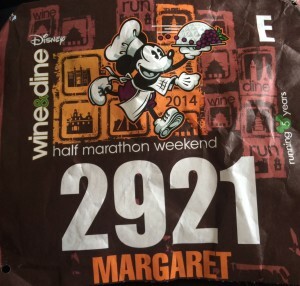 I had the privilege of running the inaugural Wine and Dine Half in 2010 and I was really excited to be back again this year, running with my husband and my dad, for the 5th anniversary race. While I know there were many times throughout the night they definitely wanted to throw in their running shoes, this event definitely made for some unforgettable family running memories! Our evening began around 7:45 pm. Runners were instructed to board the complimentary transportations busses no later than 8pm in order to make it into the coral on time. Usually, I like to board the race busses early so that I can not only allow enough time to get to the start line but also so that I can enjoy the prerace festivities and take a few photos. However, for this race, I was dragging my feet. 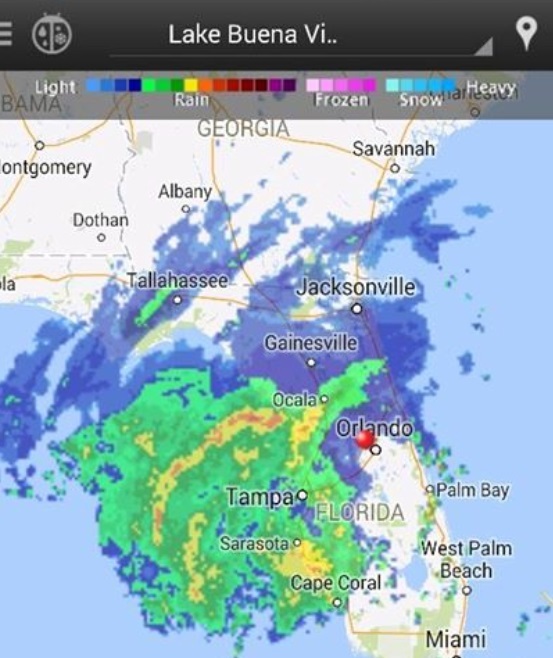 The weather for race was predicted to be soggy and as the start time drew near, the chances of us getting soaked were 100%. As much as I enjoy running, I am a fair-weather runner so the thought of being drenched to the bone for 3 hours did not motivate me to lace up my running shoes any earlier than necessary. We decided that 7:45 would still give us plenty of time to get into our coral but not too much time that we were waiting around in the rain. My mom was definitely my hero that night, and not just because she volunteered to watch all five kids AND put them to bed on our first vacation night. She also packed along rain ponchos and gave us each one before we left the resort. I have never worn a poncho—ever—and I was uncertain if it would be wise to wear it while running (I am a firm believer in “nothing new on race day”). However, I knew for certain it would be a lifesaver if the rain started while waiting for the race to begin. Like I said, we headed for the bus around 7:45pm. It was very easy to find the race transportation area at our resort and we were very lucky that there was a bus already waiting for us when we arrived. We waited only a short time while the bus filled with other anxious runners and then we were off to the ESPN Wide World of Sports Complex. It was a relaxing ride and a great opportunity to interact with fellow runDisney enthusiasts. I must say, I am certainly glad someone else was doing the driving since traffic was quite heavy and stop-and-go the whole way. I just sat back in my comfy seat while someone carted ME around for a change. 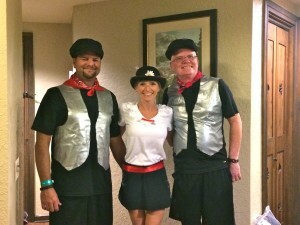 Before long, we had arrived at our destination and after a quick photo in front of the Wine and Dine Half Marathon photo spot we made our way to the pre-race waiting area. The course took us from the ESPN Wide World of Sports Complex to Osceola Parkway to Disney’s Animal Kingdom Theme Park. 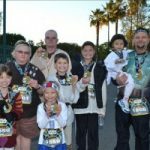 We entered the park around mile 3.5 and ran through Asia and Africa, around the Tree of Life, past Dinoland and finally exiting before mile 5. We were then back on Osceola Parkway, splashing our way towards Disney’s Hollywood Studios. This 2-mile stretch through the park was probably my favorite part of the race, aside from the finish line, of course. The course took us past The Twilight Zone Tower of Terror, through Pixar Place, past Toy Story Midway Mania, and through the Costuming Tunnel. We then made our way through the Streets of America and marveled at the Osborne Family Spectacle of Dancing Lights—INCREDIBLE!! 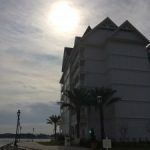 We then ran past Star Tours and Indiana Jones Stunt Spectacular towards the front of the park and then made our way towards EPCOT (and the finish line), running past Disney’s Beach Club Resort and Disney’s Boardwalk Resort along the way. The finish line was located just outside of EPCOT and the only thing that was more welcomed than the finisher’s medal was the runDisney space blanket I was given! I really enjoyed this event. I know many people have complained about the lack of on course entertainment—but due to the weather, I can see why it was lacking. Disney can’t control everything and the safety of their employees is a definite priority. There have also been some grumbles about the medal falling apart. 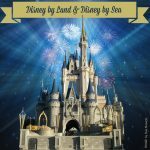 I did not have that problem but my husband’s did break the next day while we were at EPCOT. He just decided to superglue his back together. 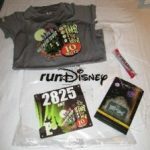 However, if you are one of the unfortunate ones whose medal broke, you can contact runDisney for a replacement. I thought the race overall was managed very well—especially when compared to the inaugural race in 2010. The course was well lit and the finish line area moved very quickly and orderly. My only complaint would be that the post race transportation busses were too far from the finish line. While I completely understand the location, I was cold, wet, and tired and it seemed like it took us FOREVER to get on that bus. As for wearing the poncho during the race, total mixed review on that one. It kept me almost completely dry during the race (plus) but it tried to kill me twice, once by suffocation and once by strangulation, during the night (definite minus!). Since the…ahem…problems occurred at middle and near the end of the race, I don’t think it was simply an issue with “something new”. I was very thankful to have had it, but I am not sure that I would run while wearing a poncho in the future. I think they made some really great improvements to both the course and finish line and the finish line drinks were a great addition (been, wine, or soda) as was the $10 Disney gift card given to participants. I would definitely do this race again someday. I just have to wait for my husband to forget the pain of this race before I spring the next one on him. Marge is an avid runner who resides in Northern Indiana with her husband and wonderful children. You can follow Marge on Twitter @RNawayMama.